The Gladiators are a classic roots reggae band known and loved for years worldwide. They have toured the globe extensively, most recently in Brazil, and Europe, Israel, and Australia. 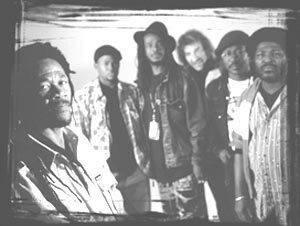 In the 80’s they toured the US extensively as a sample of pure disciplined Jamaican reggae. “Stay fresh, green and live forever. Give thanks and praise, to the Most High”- they would sing. They embodied the happy, glory filled spirit of their mission. “You can’t stop righteousness. It will grow, grow on, and on.”This year they have been chosen to work on all the major California Bob Marley Days. This is a full longstanding original band, with horn section, from Jamaica. They have a distinctive sound that they maintain, with super classic high harmonies. The Gladiators have put out many legendary recordings over the last 30 years. Catch them when you can, because this beloved sound comes from a one and a world novelty group that set a standard worldwide, hard to follow. Opening for, and backed by the Gladiators on this tour is Zema, a female vocalist with five classic CD’s out, who brings us the biblical message in song. Zema is respected for persevering as a sincere reggae messenger in these times of materialism and lost souls. For more information on Zema, go to www.zemazema.com. For U.S. bookings, contact Peter Wardle with Kings Music International at (510) 326-8445 or online at reggaeangl@aol.com. The Gladiators have been masters of the reggae arena for the past 30 years. After the rise and fall of many reggae artists and bands, they remain one of the most influential reggae groups to date. The group’s original leader, Albert Griffiths, formed the legendary band – whose name was suggested to him on a bus by a fellow traveler who had just seen the movie “Ben Hur.” The concept of men who fought for their liberty against Babylon immediately struck a chord with Albert, and remains a testament today of the difficult life and struggle of oppressed people worldwide. The Gladiators have proven on stage, and in the studio that they are, without a doubt, one of the best and most enduring original real roots, rock reggae bands. The unique sound of The Gladiators started with Albert Griffiths who was born in the parish of St. Elizabeth in the Jamaican countryside and grew up in poverty in Trench Town. In 1968 The Gladiators were born as a trio including David Webber and Errol Grandison recording for Clive Chin and Duke Reid, but it was with Coxcone Dodd that “Hello Carol” topped the Jamaican chart in 1968. Webber and Grandison were unable to continue with the group and Clinton Fearon came on board and The Gladiatrs became a duo. With Griffiths also being employed as a guitarist at Studio One and Fearon joining him on bass, the pair backed artists like Burning Spear and Stranger Cole in the late `60s. Griffiths eventually chose Gallimore Sutherland to make the group a trio again. During the 1970s, The Gladiators continued racking up hits like “Freedom Train,” “Rock a Man Soul,” “Roots Natty,” “Bongo Red,” and “Jah Jah Go Before Us” in Jamaica and the British underground. In 1974 Vivian “Yabby U” Jackson asked Griffiths and Fearon to provide backing for his “Jah Vengeance” album at Lee “Scratch” Perry’s Black Ark studios which brought in further work in this studio. In 1976 The Gladiators signed a deal with Virgin Records in Britain resulting in the esssential “Trenchtown Mix Up.” album. By the early `80s, roots bands were becoming an expiring lot, but The Gladiators continued to release excellent albums on various U.S. labels. They continued recording high-quality albums through the `90s. Even the departure of Fearon during this period could not extinguish The Gladiators’ spirit or Griffiths’ drive. Like The Wailers, The Gladiators are one of the very few reggae bands to not only survive, but succeed over the decades despite changes in members, and maintain their unique sound and message. They are one of the rare Jamaican groups that are actually a band in the true sense of the word and have a distinct style that shines forth regardless of the circumstances. Griffiths’ lyrics, filled with biblical passages and parables, are equally notable. In 2005, The Gladiators put out the fresh new “Father and Sons” album, recorded in Jamaica still faithful to their roots. These compositions are full of heart, force and courage. Featuring Albert Griffiths’ two sons, Anthony on drums and Al sharing lead vocals, “Father and Sons” is a gripping reflection on life, love and faith. Currently Albert is in the process of turning The Gladiators over to his two sons who he knows are capable of carrying on this musical heritage. With Anthony on drums setting the pace and Al’s voice, which is virtually indistinguishable from his father’s, these two young reggae warriors have proven both live and in the studio that they are fully competent to carry on the Gladiator legacy. Furthermore, they are infusing new, youthful energy into the program and continue to build the legacy and pave the way. The “New” Gladiators have garnered tremendous response touring throughout Europe, Brazil, the South Pacific and Australia, and are poised and ready to spread the message to the rest of the world! People are overjoyed to hear live, once again, the foundational Gladiators. Described as one of today’s top female modern roots reggae vocalists. Zema (pronounced zay-MAH) began her musical career at the tender age of seven with piano and creative dance lessons. As a youth, her interest prompted her to pick up several other instruments in addition to singing. She has performed and recorded reggae, R&B, rock and pop music in numerous bands. In Los Angeles, Zema has established herself as a prominent musician on the reggae scene recording and performing as a vocalist, keyboardist and guitarist. She has backed both as a keyboardist and a vocalist such internationally known reggae artists as Alton Ellis, Leroy Sibbles, Delroy Wilson, Ras Michael, Joe Higgs, Abijah, Ras Midas, Carlton Livingston and Isaac Haile Selassie. She recorded “Zema,” her first album of original material, at Channel One Studio in Jamaica, which received extensive air play and was well received touring the western United States. “Stranger in the Gates,” Zema’s second album, was widely aired on radio throughout the U.S. and abroad. It includes renown reggae drummer Sly Dunbar and Zacky, the original keyboard player for the Twinkle Brothers. On Zema’s third album, “Look at the Heart,” she again showcases her talents as singer/songwriter, arranger and producer. This release, mixed by legendary Jamaican engineer Hopeton “The Scientist” Brown, includes a guest appearance by nyabinghi master, Ras Michael, and features top flight reggae musicians including original members of The Rastafarians and Twinkle Brothers. “Black Sheep,” Zema’s fourth album, was recorded in Kingston, Jamaica with a stellar cast including such reggae stalwarts as Horsemouth, Dalton Browne and Dean Frazer. Mixed by Soljie and Sylvan Morris, “Black Sheep” has garnered tremendous response with its hard-driving rhythms and sweet vocals. New Zema releases for 2005 included the single, “Stoned Love” featuring Abijah which has been aired on IRIE FM, ROOTS FM and HOT 102 in Jamaica. The “Stoned Love” video featuring Abijah can be seen worldwide and on Jamaican TV. Zema has two new videos that will be released in 2006 including “Son and Daughter of Jah” featuring Al Griffiths and The Gladiators. Zema’s newest album is “Overcome” which was recorded in Kingston at Bob Marley’s Tuff Gong Studio with Sly and Robbie, The Gladiators and includes combinations with Abijah, Mark Wonder and Al Griffiths. Zema has been honored to tour Brazil with the legendary Gladiators and has performed in Israel, Europe, throughout the U.S. including Southern California, and in Jamaica at major stage shows such as Western Consciousness and 2006 Rebel Salute. Zema’s music has been called “healing music for the 21st century” by Roger Steffens (preeminent reggae archivist). Her style of conscious reggae music brings the universal message of love, justice, racial harmony and spiritual upliftment. Zema combines this with driving roots reggae grooves in dynamic and mesmerizing performances that captivate wide audiences with inspiring music that uplifts the heart and soul and keeps the feet dancing!